As with any hobby, starting out with fountain pens can be a bit scary. Where to start? The wide variety of brands, materials, sizes, nibs,... can be difficult to choose from. Even pricing and price differences can be confusing. It's perfectly possible to find a very decent pen in the 15-50$ price range, but you need to know where to look. 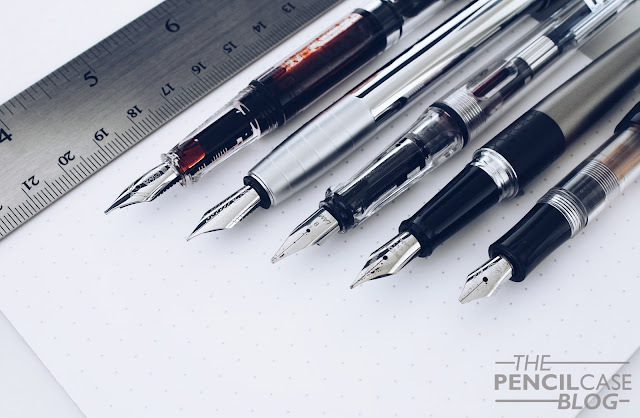 In this buying guide I'll show you around five of the best fountain pens to start off with. These are some of my personal favourites in the 15-50$ range. They should give you a head start into the fountain pen world, without breaking the bank. Something mportant to keep in mind though: These are five pens that are generally quite well-regarded, but your mileage may vary. 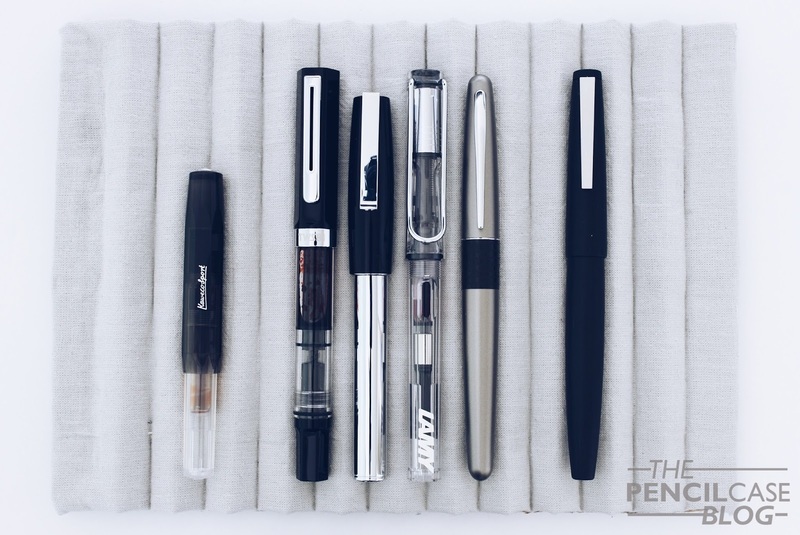 Personal taste and preference plays a huge role in finding the perfect pen, so you might have to experiment with a few different styles, sizes, materials before you find out what you're looking for. At the bottom of the page, you can find a few size comparisons. More in-depth reviews can be found through the links underneath each section. You can purchase all the pens discussed above from any of my sponsors. As an added bonus, some will give you a small discount when you use the provided discount code at checkout! Kaweco's 'sport' pens are recogniseably by their distinct pocket design with the large cap. This small plastic pen (more expensive metal versions are also available) is meant to be used with the cap posted on the back to transform it into a full-sized pen that is comfortable to use. If you're looking for a valid EDC choice, you should look no further and go with one of these! They come in a wide variety of colors and finishes (Each finish has it's own name: Classic, Ice and Skyline), and you can choose from a bunch of nib sizes (extra fine to double broad). Lamy is one of the most widely recognised brands in the world, and part of their succes is based on the iconic Lamy Safari fountain pen. The Safari is a sturdy plastic fountain pen with a unique, modern design, and comes in a bunch of bright colors (shown above is the transparent 'Vista'). The grip section has a triangular shape, which helps you to hold the pen at the correct angle. Nibs can easily be replaced and are sold separately, so you don't have to buy a completely new pen if you want to change the nib size. Moving on to the Pilot Metropolitan. Possibly the best value for money of all the pens listed here! For just 15 dollars you get a stylish metal pen with a japanese quality nib. The benefit of Japanese pen brands is that they make really fine and precise nibs. If you like to write small, you might want to check out the fine nibs on the Pilot Metropolitan. We're moving up the ladder with the Faber-Castell Loom. If you are willing to spend a little more, the Loom will provide you with a modern and cool design and a sturdy metal body. The nibs are the biggest selling point for me. Every pen in this top 5 writes good, but Faber-Castell knows how to deliver just that little bit more! Not only do the steel nibs look good, they write super smooth, and can easily compete with pens many times its price! Last but not least, a pen from the Taiwanese company TWSBI. 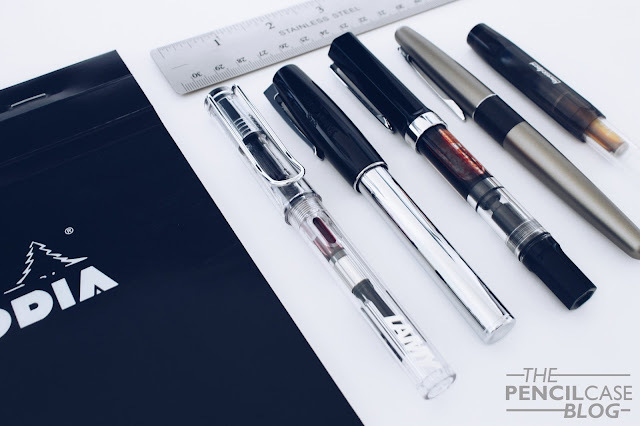 As one of the younger pen manufacturers around, they gained worldwide popularity for their affordable piston-filled fountain pens. What that means is that you can fill this pen directly from a bottle of ink with the plunger system inside (You can't use it with traditional ink cartridges like the previous pens, which is something to keep in mind). They use transparent materials which allow you to look at the piston mechanism inside the pen, and you can keep track of how much ink is left. Lamy 2000 as a reference on the far right. Note: This post does not contain any affilate links. 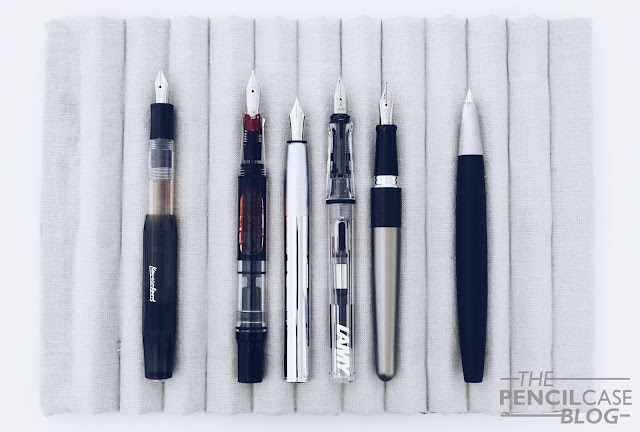 Dries, thank you for sharing your top beginner fountain pens - as you have mentioned, each pen suits a different style and can sometimes take some experimentation to work out what works best for you. My personal preference is the Kaweco Sport - I have one with a fine nib and it is very easy to write with.